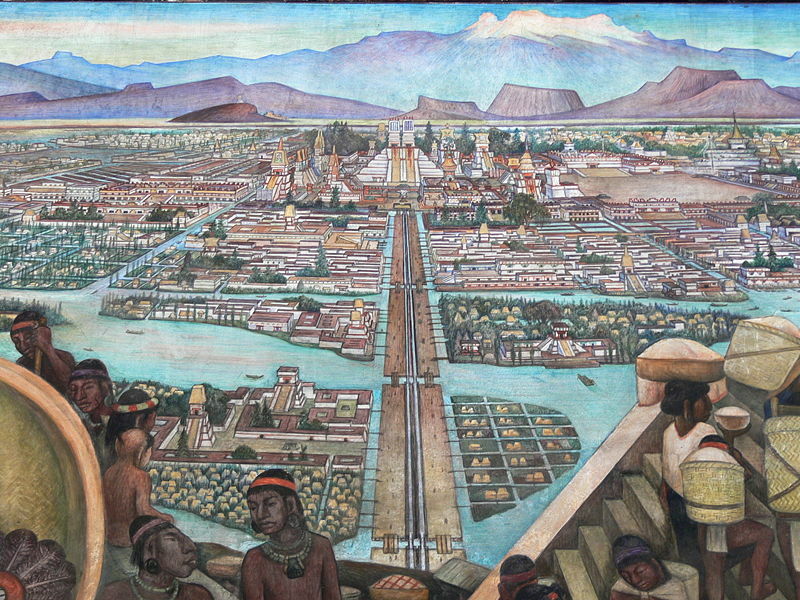 From the age of ten, Diego Rivera studied art at the Academy of San Carlos in Mexico City. In the early 1900's, he was sponsored to continue his studies in Europe by the governor of the State of Veracruz, Teodoro A. Dehesa Méndez. 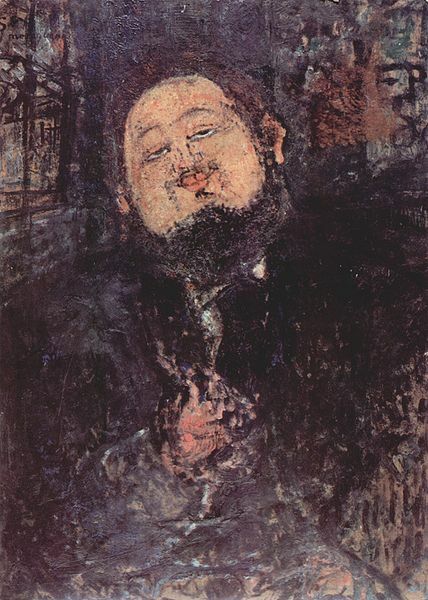 After his arrival in Europe in 1907, Rivera initially went to study with Eduardo Chicharro in Madrid, Spain, and from there went to Paris, France, to live and work with the great gathering of artists in Montparnasse, especially at La Ruche, where his friend Amedeo Modigliani painted his portrait in 1914 (see gallery below). In those years, Paris was witnessing the beginning of cubism in paintings by such eminent painters as Pablo Picasso and Georges Braque. From 1913 to 1917, Rivera enthusiastically embraced this new school of art. Around 1917, inspired by Paul Cézanne's paintings, Rivera shifted toward Post-Impressionism with simple forms and large patches of vivid colors. His paintings began to attract attention, and he was able to display them at several exhibitions. In 1920, urged by Alberto J. Pani, the Mexican ambassador to France, Rivera left France and traveled through Italy studying its art, including Renaissance frescoes. 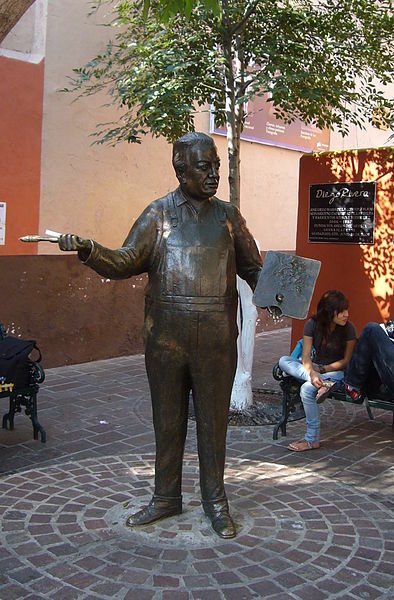 After Jose Vasconcelos became Minister of Education, Rivera returned to Mexico in 1921 to become involved in the government sponsored Mexican mural program. The program included such Mexican artists as José Clemente Orozco, David Alfaro Siqueiros, and Rufino Tamayo, and the French artist Jean Charlot. In January 1922, he painted his first significant mural Creation in the Bolívar Auditorium of the National Preparatory School in Mexico City. 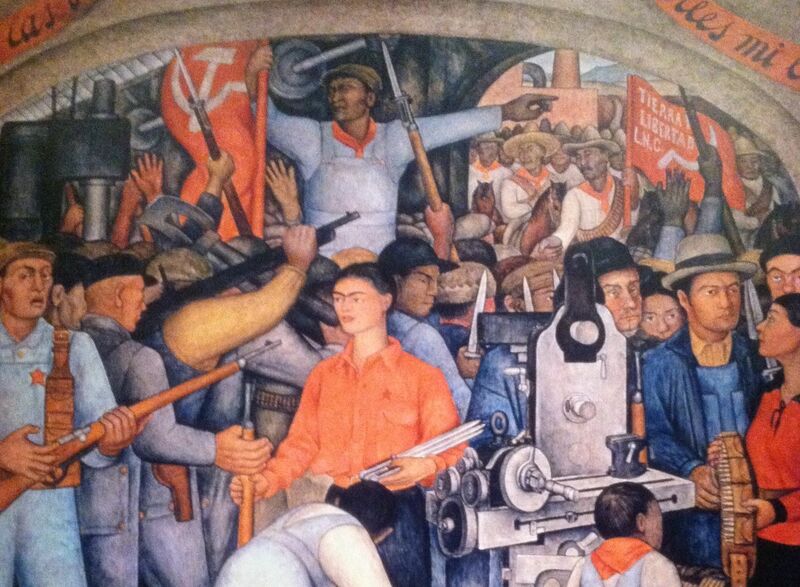 In the autumn of 1922, Rivera participated in the founding of the Revolutionary Union of Technical Workers, Painters and Sculptors, and later that year he joined the Mexican Communist Party. 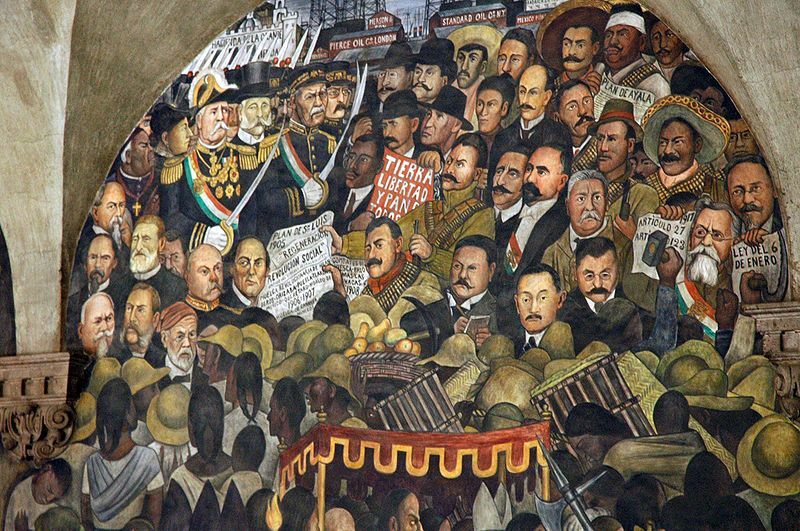 His murals, subsequently painted in fresco only, dealt with Mexican society and reflected the country's 1910 Revolution. 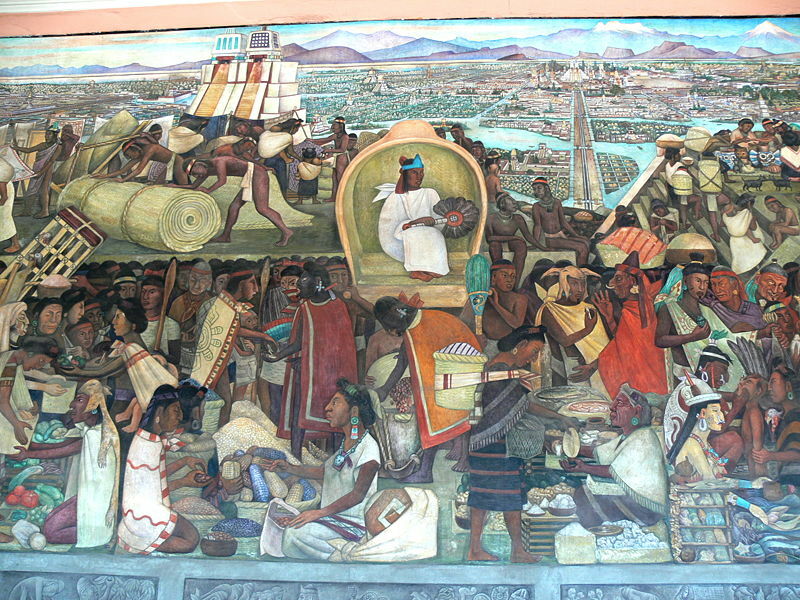 Rivera developed his own native style based on large, simplified figures and bold colors with an Aztec influence clearly present in murals at the Secretariat of Public Education in Mexico City. He started this work in September of 1922, intended to consist of one hundred and twenty-four frescoes, and finished in 1928. Rivera's radical political beliefs, attacks on the church and clergy, as well as his dealings with Trotskyists and left-wing assassins made him a controversial figure even in communist circles. 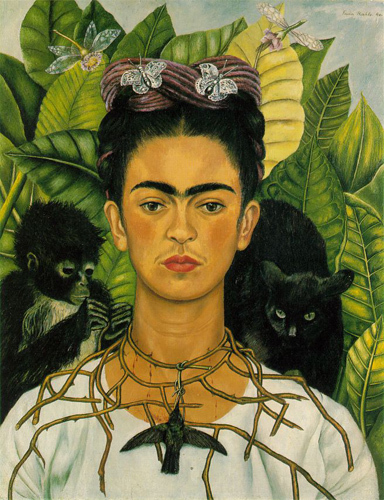 Leon Trotsky lived with Rivera and Kahlo for several months while exiled in Mexico. In the autumn of 1927, Rivera arrived in Moscow, accepting an invitation to take part in the celebration of the 10th anniversary of the October Revolution. 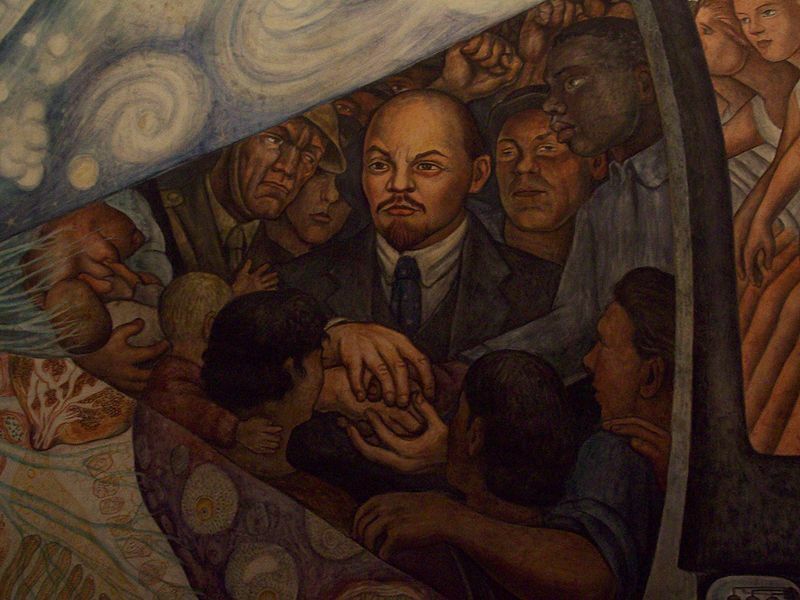 Subsequently, he was to paint a mural for the Red Army Club in Moscow, but in 1928 he was ordered out by the authorities because of involvement in anti-Soviet politics, and he returned to Mexico. 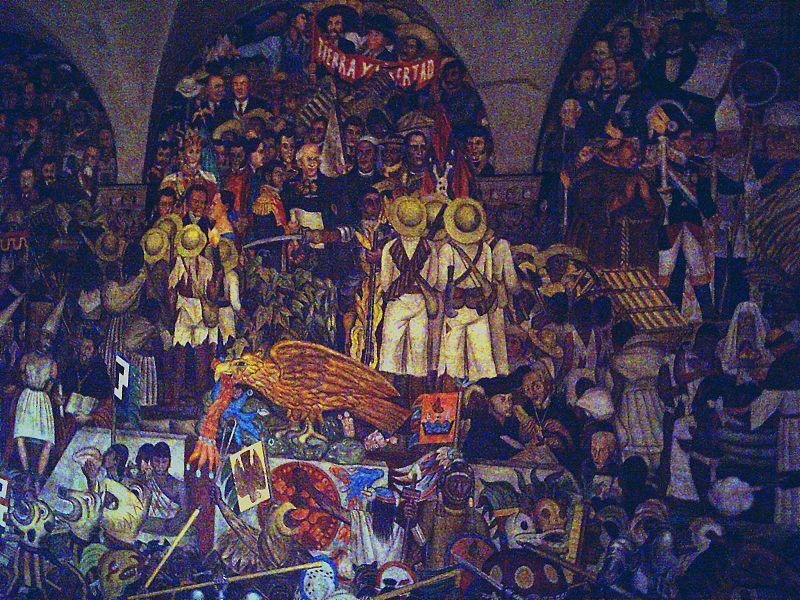 In 1929, Rivera was expelled from the Mexican Communist Party. 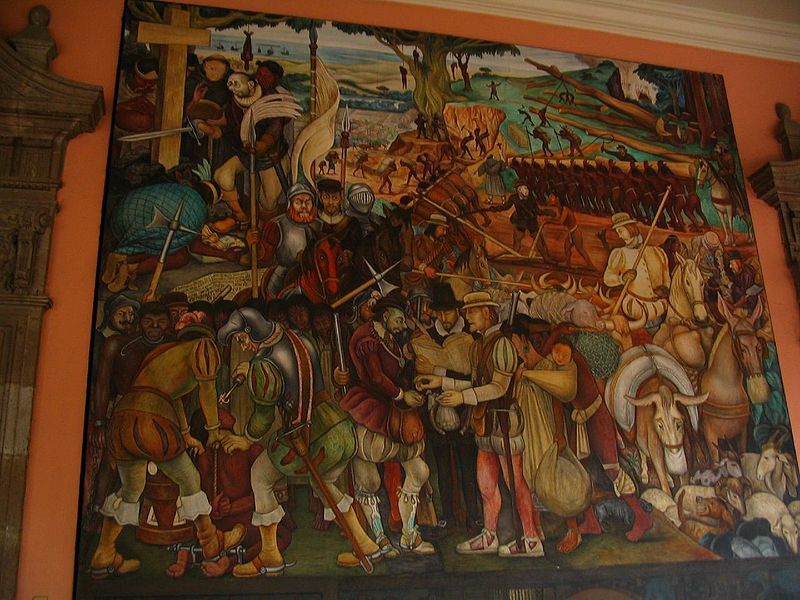 His 1928 mural "In the Arsenal" was interpreted by some as evidence of Rivera's prior knowledge of the murder of Julio Antonio Mella allegedly by Stalinist assassin Vittorio Vidali. 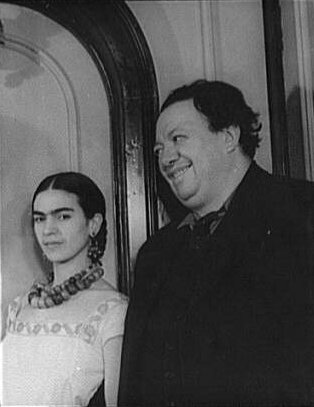 After divorcing Guadalupe Marin, Rivera married Frida Kahlo in August 1929 (see a virtual tour of Frida Kahlo's House and Museum in Mexico City). Also in 1929, the first English-language book on Rivera, American journalist Ernestine Evans's "The Frescoes of Diego Rivera", was published in New York. 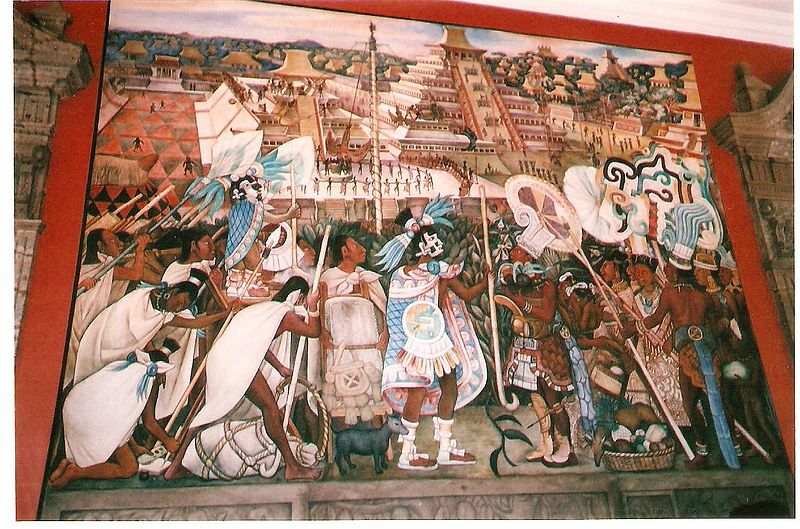 In December, Rivera accepted a commission to paint murals in the Palace of Cortez in Cuernavaca from the American Ambassador to Mexico. In September 1930, Rivera accepted an invitation from architect Timothy L. Pflueger to paint for him in San Francisco, California. 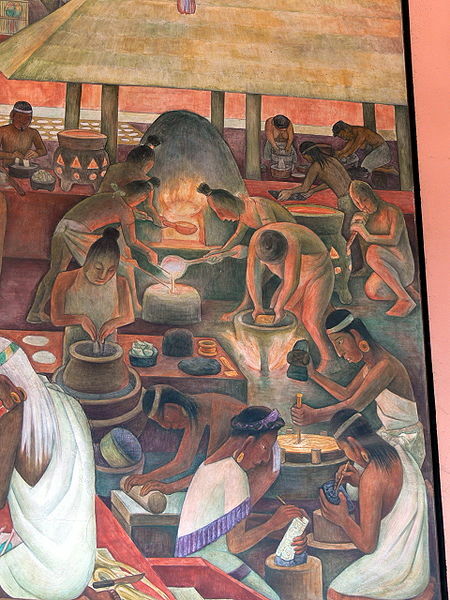 After arriving in November accompanied by Kahlo, Rivera painted a mural for the City Club of the San Francisco Stock Exchange for US$2,500 and a fresco for the California School of Fine Art, later relocated to what is now the Diego Rivera Gallery at the San Francisco Art Institute. In November 1931, Rivera had a retrospective exhibition at the Museum of Modern Art in New York City. 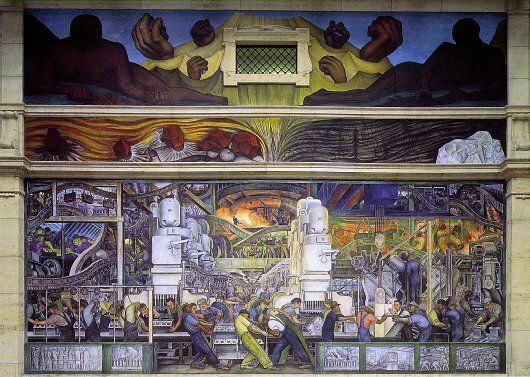 Between 1932 and 1933, he completed a famous series of twenty-seven fresco panels entitled Detroit Industry on the walls of an inner court at the Detroit Institute of Arts. During the McCarthyism of the 1950s, a large sign was placed in the courtyard defending the artistic merit of the murals while attacking his politics as "detestable." His mural "Man at the Crossroads", begun in 1933 for the Rockefeller Center in New York City, was removed after a furor erupted in the press over a portrait of Vladimir Lenin it contained. The American poet Archibald MacLeish wrote six "irony-laden" poems about the mural. The New Yorker magazine published E. B. White's poem "I paint what I see: A ballad of artistic integrity". As a result of the negative publicity, a further commission was canceled to paint a mural for an exhibition at the Chicago World's Fair. Rivera issued a statement that with the money left over from the commission of the mural at Rockefeller Center (he was paid in full), he would repaint the same mural over and over wherever he was asked until the money ran out.In December 1933, Rivera returned to Mexico, and he repainted "Man at the Crossroads" in 1934 in the Palace of Belle Arts in Mexico City. This surviving version was called "Man, Controller of the Universe." 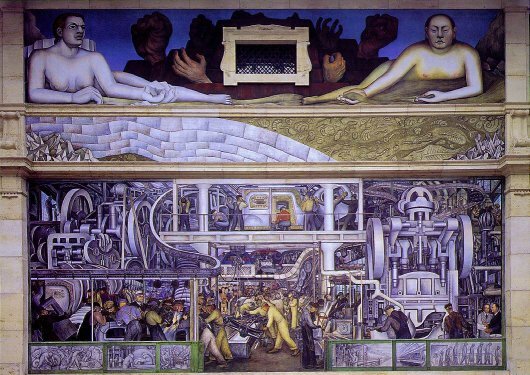 Rivera returned for the last time to the United States on June 5, 1940, again at the invitation of Pflueger to paint a ten-panel mural for the Golden Gate International Exposition in San Francisco titled "Pan American Unity," completed on November 29, 1940. As he was painting, Rivera was on display in front of Exposition attendees. He received US$1,000 per month and US$1,000 for travel expenses. 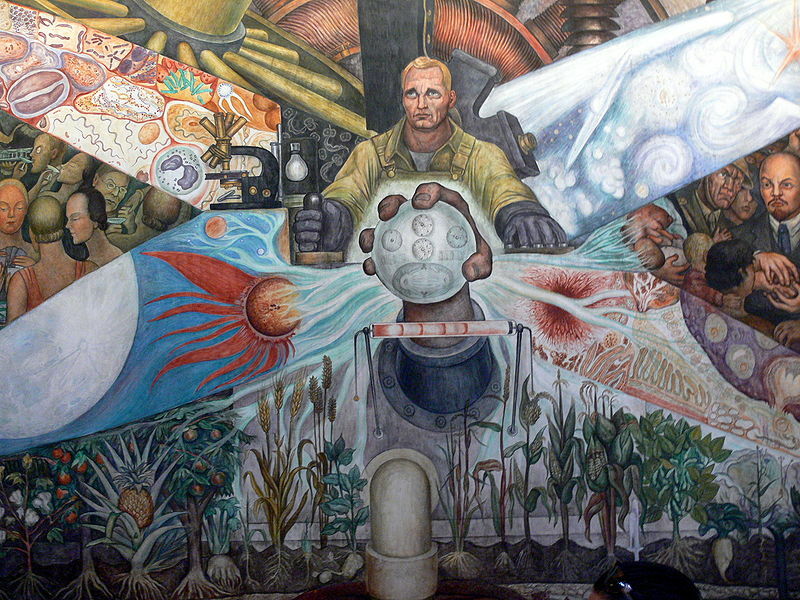 The mural includes representations of two of Pflueger's architectural works as well as portraits of Kahlo, woodcarver Dudley C. Carter, and actress Paulette Goddard, who is depicted holding Rivera's hand as they plant a white tree together. Rivera's assistants on the mural included the pioneer African-American artist, dancer, and textile designer Thelma Johnson Streat. The mural and its archives reside at City College of San Francisco.